Holiday.gr - Messaria, a trip to a myth! In the center of the island and in an area full of vineyards the village of Messaria is built. It is 3,5 km towards the southeast of Fira. A beautiful traditional village famous for its’ exceptional wine. Worth mentioning is that the vineyards of Messaria produce a large portion of the islands’ wine production. 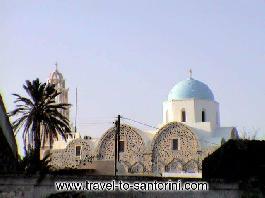 In the village there are two distilleries which you can visit and taste the fine wine of Santorini. In Messaria you will find many hotels in which you can enjoy the worm hospitality of the cycladic islands. Been to Messaria ? Share your experiences!